Life isn’t easy for Dill Early. If being the son of a extreme faith Pentecostal minister who asks his congregation to handle poisonous rattlesnakes and drink poison wasn’t enough, his father going to prison is. Not only is he a target for bullies at school, but his own mother doesn’t give him a break. Alternating chapters between Dill and his two best friends—Lydia a internet famous fashion blogger, desperate to leave their small town, and Travis, a steady, content pillar who spends most his time immersed in his favorite fantasy books—author Jeff Zentner creates three amazing and completely different characters on a coming of age journey that touches on Faith, Friendship, and Fate. With graduation nearing, Dill feels more and more trapped in the life he seems condemned to live. 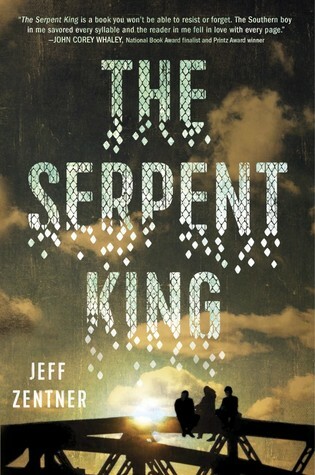 Condemned by his family’s situation and condemned by the blood of The Serpent King, Dill must find a way to break free. This is something you have to experience for yourself, because it's hard to put into words. This is beautiful, painful, maddening, and heartbreaking. Zentner doesn't sew it up completely pretty either, which lets the sadness in this story feel real—like you've been scrubbed raw, but you're healing. Whether you believe in God or not (or whatever way you believe in God) this was extremely thought provoking on what it means to have Faith and to be faithful. While it portrays an extremist type of faith in Dill’s parents, I believe that some of the feelings and situations spread out to anyone who lives religiously to any degree. Despite some of the heavier themes of varying types of abuse and family hardships, The Serpent King still incorporates many of the Young Adult themes of love and friendship that lift this up with humor and hope. The characters are excellent. I adore Lydia. She was the perfect voice of humor and strength that lifted this heavy story up. For a story with some pretty heavy parts, I found myself dying laughing over Lydia. But it's Travis that will steal your heart and he's so quiet about it you won't even notice he's done it at first.